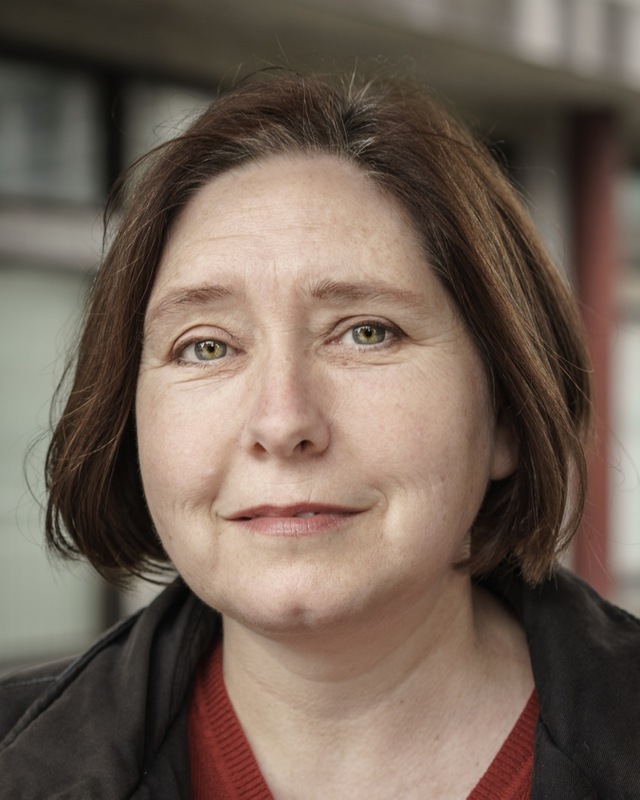 After growing up in Australia, Laura Quigley moved back to the UK. She studied drama and media at University and headed into film production only to end up in educational publishing. A film addict at heart, she turned to screenwriting after the birth of her second child. Now settled in Plymouth, Laura has developed a knack for exploring the dark side of local history. 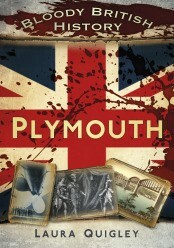 Bloody British History of Plymouth recounts gruesome true stories from the region. 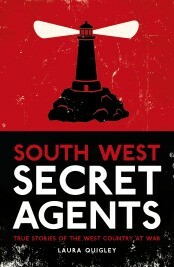 South West Secret Agents reveals spy stories from World War II. Laura also writes fiction, and has a new children’s series out from Forelock Books. After some initial small successes in theatre and film, I won a Human Rights Playwriting Award with Amnesty International in 2010. Sadly the creative industries in the UK got hit badly by the recession and the tour of my first full-length play had to be cancelled. Funding just vanished. And my growing family was also making it difficult for me to attend rehearsals—something I hadn’t anticipated, I have to admit. But my winning play was based on a true story so I thought perhaps all that research might become a non-fiction book and The History Press agreed. Two more non-fiction history books followed—the latest about WW2 and very successful, which is lovely. I’m on the public speaking circuit too, with history societies, festivals and libraries, and last year, I made it into Plymouth International Book Festival. Also in 2014, I was commissioned by a new publishing company to write an historical fiction book for children, which has been a fun experience. I keep getting asked back onto the radio because of that one and it’s the start of a series, so that should keep me working for a few years. WHAT’S YOUR LATEST BOOK OR CURRENT PROJECT? 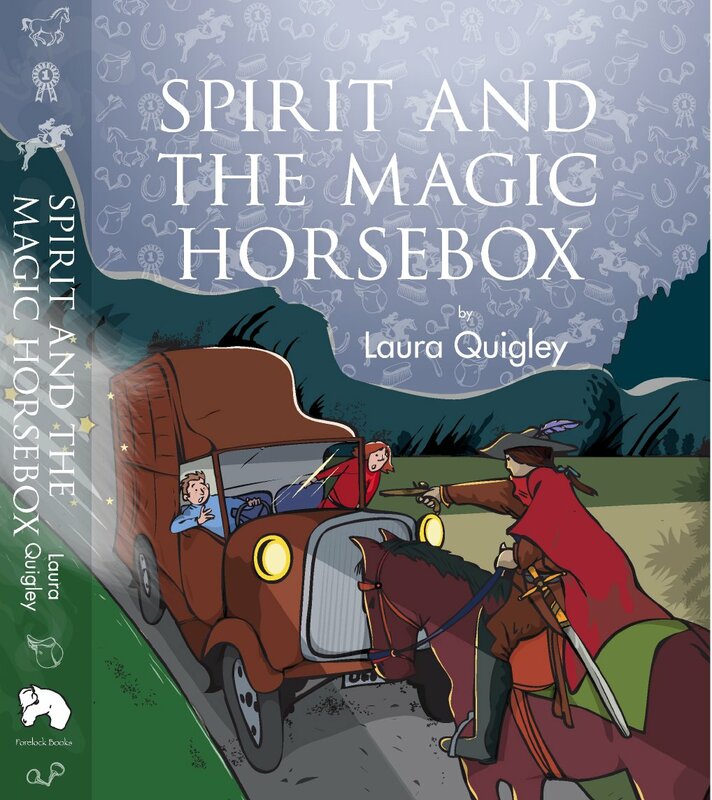 My new series is a fun time-travelling adventure for all ages, starting with Spirit and the Magic Horsebox. I’ve also got a new audio-play series out with Word of Mouth Productions in 2015—science fiction, which I love writing. And three more books on the go. All fiction. I work in chaos. I know it’s pathetic but I’m still a kitchen table writer and my family is getting justifiably sick of it. They’re also sick of me making very little money, so I really do have to get more professional in everything I do. I’ve got notebooks everywhere, really, EVERYWHERE. So 2015 is the year I get myself organized. 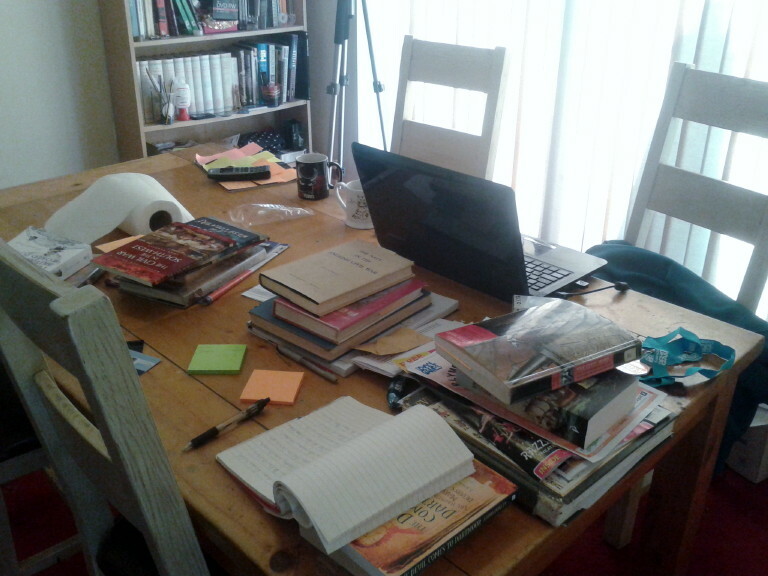 I can’t believe I’ve produced four books and so many plays from this mess. Just think what I could do if I had a proper desk and shelves! I used to work nights when the kids were small. That was hard—looking after toddlers all day after very little sleep. Now they are teenagers, I work during school hours—trouble is, creatively I’m a night owl. My imagination works best in the dark. I’m finding exploring ideas and creating characters at ten in the morning very strange, and the neighbours must think me very odd as I work with all the curtains closed. But once I’ve really started on something, I can work without stopping for however long I’ve got before my son comes home, crashing through the front door. Then in the evenings, I do more research or reading, and maybe make notes for the following day. Whether it’s fiction or non-fiction, I work the first month without actually writing a thing. I live with the idea of the book for weeks before I set down to write. I’ll explore what else is out there, what the competition is like, what the market’s doing etc. If there’s an important location, I’ll visit if I can. I get to know the characters of the new book by inviting them to live with me for a while and when I know them well enough, I’ll write down what they tell me to write. For non-fiction, I do try to keep organized with references and notes, but I lose things and when it comes to the final edit, I’m often found searching for the references again. And don’t get me started on sorting out images and photographs! I’ve always written stories, since I was nine years old, and I’ve kept all of them. The writing comes at me whether I want it or not. But I became a professional writer to stay sane. I’m not programmed to be a full-time mother and homemaker. I was used to working long hours outside the house, juggling deadlines etc, so I needed something to keep my brain working while I cared for the kids. And writing was a good fit. Research can be good for the brain too—it keeps you reading, exploring the outside world, and I’ve learned a lot. And sharing those things has become a passion. I discover a great story and think “everyone should hear this one”, and then I have the joy of re-telling it to others. Sadly what compels me now is money. Over the years, the writing has felt more like an expensive hobby, so now I really need to make some money, make it pay its own way, cover its costs, and hopefully give something back to the family. I know I can earn enough to change the quality of our lives— I just have to make it happen. I’d like to say other writers, but I find their success stories can add to my own sense of frustration. I do read a lot, however, so I am inspired by good writing. Also good TV. There’s some amazing writing in TV right now. The “box set” culture is transforming the way we tell stories and I’m often inspired by TV writers. When it comes to ideas, I am interested in EVERYTHING. I am fascinated by technological and social changes, cultural dynamics, philosophy, people everywhere, political, geographical and environmental issues. You name it, it’s interesting. Even the smallest story has big ideas in it. It’s like the universe itself: the patterns of the biggest galaxies are repeated in the smallest atoms. And the smallest stone creates ripples across the surface of even the biggest oceans. WHAT’S THE HARDEST PART OF WHAT YOU DO? Explaining to my family why I’m doing what I do is the biggest challenge. They still don’t get it. They think I’m just wasting my time and theirs. Why haven’t I vacuumed the carpets today? Why don’t I just get a job at the local supermarket? That would pay more! And with more money coming in, we could replace the broken bathroom suite or go on a decent holiday. So my big challenge is getting other people to believe in what I am doing; seeing the long-term benefits. As a writer, I want to get into people’s heads and hearts, get them excited and make them FEEL something. In the modern world, I think we are alienated from our own emotional lives. We’re in danger of losing that key element that makes us human beings, and that is undermining our will power, our ability to make changes to the way things are. Passion has become a luxury. I’d like to reignite that passion, in my own life as well as others’. We need to be more than the designs of our consumer culture. Sadly, I think the literary world is succumbing to that same consumer culture. I walk into my local bookstore and it’s piled high with commodities not ideas. They could be selling toothpaste. I’m not knocking entertainment. I’m into entertainment— that’s where communication starts. Humans have entertained each other with stories since forever. But the good story is so much more than the words on the page wrapped in pretty packaging. Stories should be about inciting change in people’s lives, the way they think and feel. WHICH FEMALE AUTHORS WOULD YOU LIKE TO HEAR MORE FROM? I’d like to hear more from real women and women in history. Chick-lit is great entertainment, but it’s often just about repackaging the fantasy romance. It’s mental valium, keeping women readers anesthetized, unaware of what’s really going on. Keeping the fashion and baby industries going. That makes me sound like a radical feminist and if you could see how I live, you would know that I’m anything but radical. But I’m aware that women are being told lies and there has to be more to our lives than this. I read a lot about women in history and some of these women achieved so much regardless of the limitations of society. I love women who challenge boundaries. Society needs more of those, so I’d love to read more about those women. This might sound contradictory, but I’d also love to hear from women writers who are exploring what it is to be a man in this world. It’s not great for men either! I think there are a few women writers with a fascinating perspective on this. Hilary Mantel does a fantastic job with Thomas Cromwell, and Room by Emma Donoghue looks good. One of my favourite books about motherhood was written by Lionel Shriver, We Need to Talk about Kevin. It’s horrific, but a fascinating nightmare study of motherhood. More books like that, please.